Proper water management or irrigation is essential for agriculture. Too wet land must be drained to be processable, too dry land should be irrigated in order to become viable. Picking up water with jugs or buckets is the simplest and oldest way to irrigate. There are several techniques devised to do that heavy work faster, more massive and with less effort. The discharge head is always limited. If the height or depth to bridge was too large, numbers of devices were placed in a row, with intermediate reservoirs. The same principles were also used to empty the holds of ships regularly with pumps. The shadoof is a pole with a stake as a T shape. 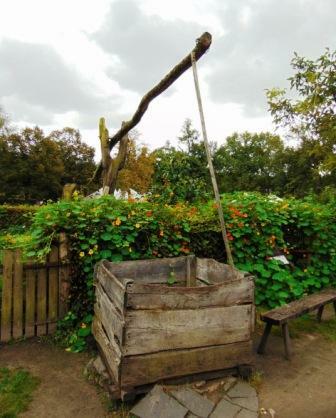 At one end a rope with a bucket, at the other end a counterweight (basket of stones, mud bucket...). You can have a better and more stable pivot point as the top pole has a fork where you can make a rod through the ends and trough the intermediate stake. Since about 2,400 BC this invention has spread from Mesopotamia through Egypt to the Mediterranean Sea. The sakia (or Persian wheel) is a chain with buckets which runs over two large wheels, similar to the chain pump. She was mostly driven by animals via a cog gear. The sakia was around 500 BC invented in Persia. The head can be up to 7.5 m, and in full operation can irrigate 8 to 10 hectares per day. With the chain pump water, soil or sand can be brought up. The Chinese base model from the 1st century consists of two wheels, no border, so just spokes with a groove, over which the chain runs. Between the spokes fit the square scoops of the chain. They scratch trough a gutter, or on other models with round scoops, they can also be passed through a tube. When using rectangular scoops a slope can be used up to 24 degrees, and a height of 4.5 meters. In addition to the upper wheel, there are yet on either side four cross-spokes in (or through) the shaft. Transverse, to step on as pedals are round blocks on their heads, so two people can operate them with the feet. There is a crossbar provided that they can hold themselves while they are stepping to give the chain a permanent movement to bring up material. These pumps are mainly used for irrigation and as a bilge pump on ships (to scoop). From the 16th century, we also used them in Europe. Subsequent derivatives are the conveyor belt, the dredger and dig mills. In developing countries like Nicaragua is the rope pump (or paternoster pump) popular. You can as with a double-acting pump in constant motion and from at great depths (35-40, even 80m!) pump a constant stream of water. The deeper the water is, the smaller the diameter of the tube must be , otherwise the weight of the water to pick up is too heavy. A (plastic) tube extends into the groundwater. At the top is a wheel (e.g. created with the lateral flanks of a car tire. They are sturdy and yet a little bit supple. Cutting rubber works easier if you keep it wet). In a long rope are each 75 cm (rubber or plastic) pistons knotted, with a clearance of 0.5 to 1mm to the tube. The in between seated water ensures sealing and lubrication. The bottom of the tube is funnel-shaped, conductive widened there is a wheel or a bottle mounted. The rope is passed (positioned in front of the pipe in the well) as a closed loop through the tube over the pick-up wheel, leading back to the 2nd wheel (or bottle). Watch out if you stop pumping. The tube has still an entirely filled column that pulls on the rope, so the pump will run back when the crank is released. Better provide a pawl. The noria replaces two wheels with chain by one very big wheel. They were made ​​up to 20 m high. A noria could be driven by animals, wind or water. The Archimedes’ screw (of Syracuse) in Sicily was designed in the third century BC. The sipho was a double piston pump developed by Ctesibius (Alexandria). By the double action, there was a constant flow of water, making them later served as the basis for fire pumps (and flamethrowers). The higher leveled water is brought through a network of channels with locks to the cultivated land. As early as the 8th century BC were deep underground tunnels for water dug from Iraq to Turkmenistan (usually less than 5, but up to 70 km), with about each 20 to 40 meters a well (20 to 200 m deep, for light, air, soil transport, access, control of the direction). Many of these qanats still exist. Water from deep underground sources in a hill can be led that way without much evaporation or contamination to agriculture in the valley below. There is dug from the valley to the (test) source. The decline may be minor to avoid leaching. In the countryside you can see the typical soil heaps. As early as 400 BC qanats were also used to store (winter) ice (in the desert in the summer!)! from the mountains. In dry areas deep rooting plants may indicate underground water. The Raschpëtzer at Helmsange in southern Luxembourg is the only Roman qanat around here.